The Avg. Group Discount is 5.7%! Nevada Museum of Art, River Walk, National Automobile Museum, AAA Baseball Stadium next door, Kayak park, several Golf Courses, Skiing, Lake Tahoe just 45 minutes away. The hotel is definitely dated and needs some refurbishing as well as a good cleaning. Complained about first room cleanliness and was moved quickly to another room, which still had issues but better than first. Staff was all extremely pleasant but not overly abundant in numbers at the front desk. Not sure why there is a resort charge as it is not resort caliber. Parking was difficult for self park, no accommodations specific to hotel guests. day use clients park in same lot. Stay if you get a good rate otherwise try one of the newer hotels. 08-Apr-2019 Verified Review, stayed from Fri Apr 05 to Sun Apr 07 2019 at a $111.62 average nightly rate. They put me on the top floor. The room was beautiful and gave me an amazing view of the Reno strip and an awesome Sunset! 01-Feb-2019 Verified Review, stayed from Thu Jan 31 to Fri Feb 01 2019 at a $30.87 average nightly rate. From the ease of making my reservation, Harrah's met all my needs. It was easy to find and register. There were good places to eat without leaving the building and the room was comfortable and clean. 18-Jan-2019 Verified Review, stayed from Wed Dec 19 to Thu Dec 20 2018 at a $47.44 average nightly rate. 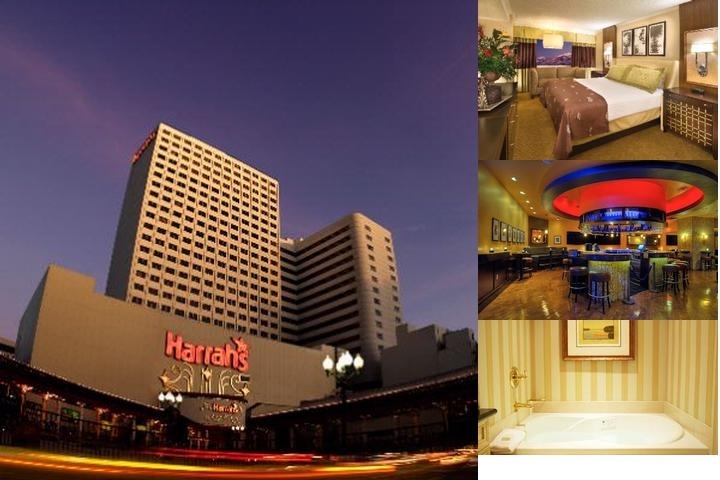 Harrah's is conveniently located in the center of downtown Reno, ten minutes from the Reno Tahoe International Airport. Surrounded by a variety of specialty stores, restaurants, and the picturesque Truckee River, Harrah's Reno is the city's premier downtown facility. Harrah's features 928 beautifully appointed rooms and suites, including all the luxurious bath amenities, a full-size health club and spa. With 14,000 square feet of meeting space in our Convention Center, we're well equipped to handle any size group. Harrah's also has seven great restaurants, including our newest addition, Ichiban's Japanese Steakhouse and the award-winning Harrah's Steak House. Plus, Sammy's Showroom, which features nightly entertainment, lavish stage productions and hot headliners. For your night relaxation we have the elegant Sapphire Lounge that has both an exciting and warm atmosphere. We also offer valet, self-parking and complimentary shuttle service. With so much to offer, Harrah's Reno's guests may never have to leave. Hotel Features – The 60,000-square-foot, 24-hour casino is the centerpiece of Harrah’s Casino Hotel Reno, a AAA Three Diamond hotel. Guests can take in a show or revue, or dine at any of the resort’s seven restaurants, featuring Italian, sushi, steak, and more. The property features 928 guest rooms and offers pampering services at their spa and salon, as well as access to a fitness room. The casino floor features the latest slot machines, table games, a poker room, race and sports book betting, and Keno. Guest Rooms – The East and West towers at Harrah’s Casino Hotel Reno each have rooms with one king or two double beds. The East Tower Classic room choice has 32-inch TVs with pay-per-view movies, hair dryer, electronic room keys, private voice mail, 24-hour room service, wireless Internet access, and ironing and ironing boards. Refrigerators, cribs, and rollaway beds are available upon request for a fee. A West Tower Classic room has the same amenities but features a 19-inch television. Guests can use the express check-out from their rooms. Non-smoking, smoking, and disabled-access rooms can be requested. Perks & Amenities – The Harrah’s Casino Hotel Reno’s Health Club includes free weights, weight-training machines, stationary bicycles, treadmills, and Stairmasters. The Health Club also has men’s and women’s locker rooms with showers, a steam room, Jacuzzi tubs, redwood saunas, and Wolff tanning beds. Guests can also enjoy cocktails at the Sapphire Lounge, receive beauty services such as haircuts and manicures at the hotel’s salon, or get pampered at The Spa and Salon, featuring massages, facials, and body therapies. Tip – Pets can stay at Harrah’s Casino Hotel Reno’s kennel, located in the Valet Porte. It is open 24 hours a day, and guests are responsible for their pet’s care. Five Minutes from Reno-Tahoe International Airport. 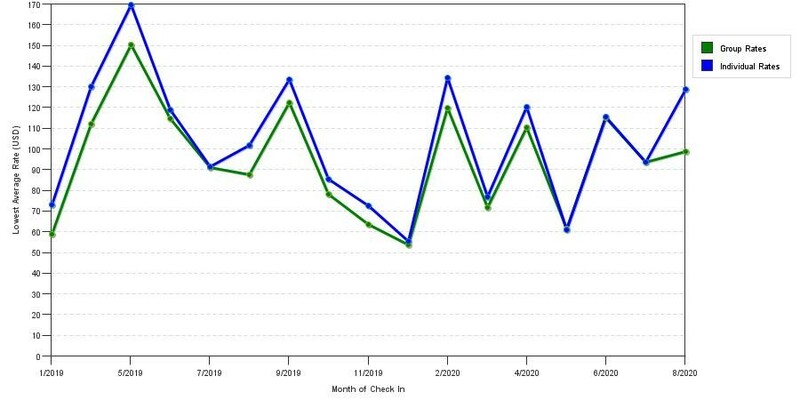 The chart above shows averages of prices for both group/meeting prices and the best individual traveler rates our rate checker could find at the time the group bid was submitted. The most competitive group/meeting discount shown is 19.5% in January 2019 and the highest average individual rate is $183 in the month of August 2019. This chart will show past seasonality and also project future months. If you are flexible with dates, you may want to consider staying at Harrah's Reno in a month when rates are lower.